"How on earth am I going to make Always Artichoke go with Basic Gray and Crushed Curry?" was the thought going through my head as I worked on two challenges from Splitcoaststampers. I almost gave it up and did only the card sketch portion. But then, that is why they call them challenges, right? So after fussing awhile longer and wishing I had some designer paper to lead the way, I realized there was some in the stash. The one on the left is not Stampin' Up! but it meets the color requirements. Of course, I really loved the colors once I got finished. Although it didn't photograph well, the dark green button in the center is the perfect color and really pretty. It was from my stash which I replenshed today on a trip to my favorite fabric store with my Mother. Check your local fabric store for a "button" box or see if they sell damaged or partial pack buttons in bags for a reduced price. Stampin' Up! designer paper in single colors and the pattern packs available for Hostess sets have a solid color sheet great for punching borders using intricate punches. Often this is easier than punching regular cardstock. The solid gray here is the reverse of the white and gray pattern. Cut DSP so their is a not-so-busy area for stamping the greeting. 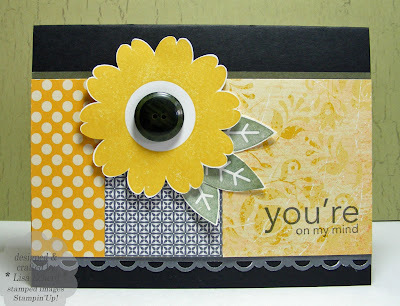 Ingredients: Stamps: Petal Pizzazz and Upsy Daisy (for greeting) from Stampin' Up!